The Tithe Applotment books were compiled following an act of parliament of 1823. Tithe was a tax on land, payable to the Church of Ireland. The books are arranged by civil or Church of Ireland parish and townland. They list the occupiers of land, the amounts held by each and the amount of tithe payable. These records are available on microfilm in Sligo Local Studies Reading Room or online by clicking the link above. The valuation of property, commonly known as ‘Griffith’s Valuation’, was compiled in the period 1848 to 1864. 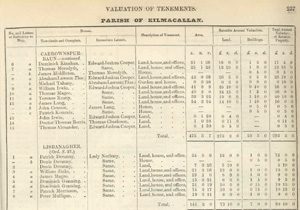 The valuations for Sligo were published in 1858. They are arranged by union, barony, civil parish and townland and show the head of household, lessor, description of tenement and area and valuation. The Griffith’s Valuation bound volumes for Sligo, Leitrim and Roscommon are available in Sligo Local Studies Reading Room or online by clicking the link above. The two complete surviving census, pre-independence, are those for 1901 and 1911. The household returns are arranged by District, Electoral Division and Townland. Microfim copies of the 1901 Census and 1911 Census are available in the Local Studies Reading Room or online by clicking the link above. Catholic Clergy were required to keep records of Baptisms, Marriages and burials altough very few done so until the 1830’s or later. Our Sligo Graveyard inscription collection of almost 40 volumes hold invaluable details regarding the inscription and location of individual family names within a specific graveyard. The Index to this collection can be accessed by contacting the Local History staff member on duty.